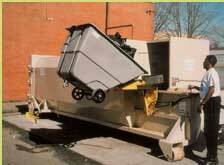 Use these products for weekly volumes of more than 30 cubic yards of Non Compacted wet or dry general waste materials. All models have a packer head permanently attached to the container and are liquid tight. Compaction Plus offers a vast array of sizes and types of Self Contained Compacting Units. We have Custom Built units as well as Standard Units to meet each Customers specific space, volume and feed system requirements. Appleby College, Oakville Ontario. 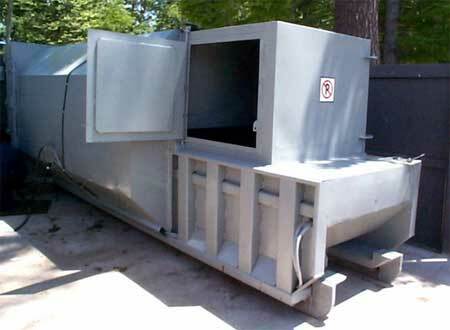 Self Contained Compactor with Side Feed lockable Cabinet. 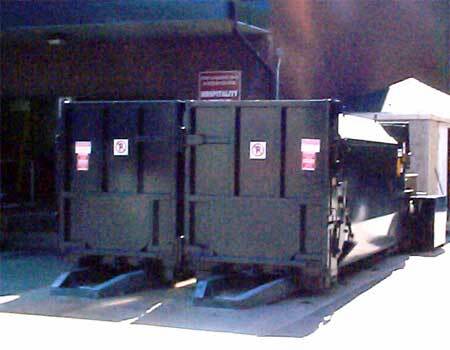 Self Contained Compactor with Ground Loading Auto Dumping Mechanism unit Installed. Not all units require custom applications but when the need is there our design team can take on almost any challenge. McMaster University, Hamilton Ontario Canada, presented us with the above challenge. 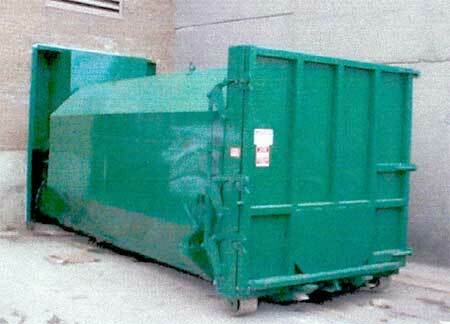 Design a system in a very limited space to compact two streams of material, Waste and Cardboard. Our Customer required us to not block the fire lane or interfere with truck access to the shipping area. 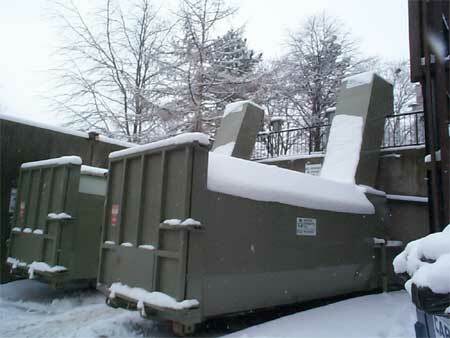 Here is the solution: Two Side By Side Custom Built Self Contained Compactors, Rear Feed off the Dock. 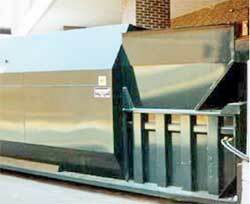 The customer was so impressed they allowed us re-design the waste handling system for the entire campus. We installed an additional 12 units of various styles on site. Let us solve your challenge. Compaction Plus can design one or multiple units that are both cost effective and user friendly. Please contact us to arrange a site meeting or for a quotation on standard applications. Hamilton Health Sciences Centre, Rear Feed Thru Wall Application. 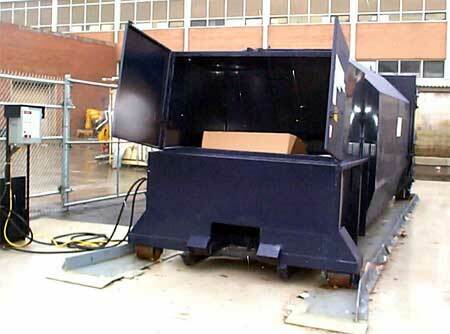 This unit was built right into the building to allow easy disposal of material while protecting their staff from the elements. Wilfred Laurier University, Kitchener Ontario, Rear Feed Double Loading Door Extra Large Capacity. 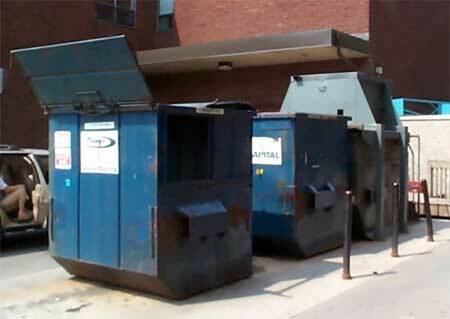 We converted the entire campus from multiple front end bins into eight Self Contained Compacting units across the campus. This dramatically reduced costs and truck traffic on their site. 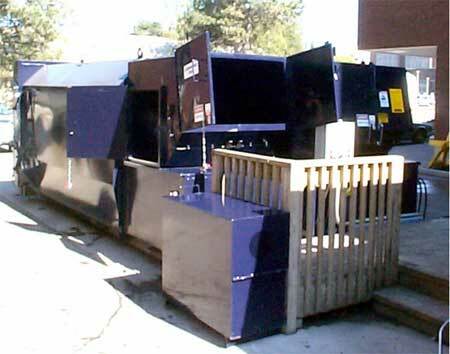 Wilfred Laurier University, Kitchener Ontario, This system shows two Self Contained Compactors with Dual Upper and Lower Loading Features.This made it possible to load the compactors from the ground and from a second level dramatically decreasing handling time of Waste and Cardboard materials.